One of the principles of a local re-use is the separation of different wastewater streams to increase the possibilities. The characteristics are in this case well identified and different which allows adapted treatment and recycling. The segregation of effluent implies the multiplication of discharge and storage systems and the management of the different parts of the recycling unit. The Technical Demonstration Centre is implemented in the student house, public building of three floors of a capacity of 212 persons, at Cité Mahrajen Tunisia by CERTE in the frame of Meda Water project (Zer0-M). The Technical Demonstration Centre is divided into three lines of treatment relating to grey water, black water and rain water and three objectives of re-use for toilet flushing, landscaping and showering, respectively (figure 1). Technologies established are membrane bioreactor MBR, (BUSSE GmbH, Germany), sequencing batch reactor SBR (PONTOS GMBH, Germany) and Constructed Wetland. The rainwater is collected from the roof of the student house building (approximately 600m2) in a storage tank (14 m3) after screening. The outflow of the storage tank discharges into sand bed for rainwater infiltration. The pumped water is filtered with sand filter and heated using solar energy before to be recycled to supply one shower. Sludge produced by the TDC is treated in a planted composting bed. The drop of water is used three times after adequate treatment for the adapted reuse and there is not any discharge to the network system (Figure 2). The TDC concept was presented in the World Water Forum as solution for SWM (12-17 Mars Marseille 2012) and in several meetings. 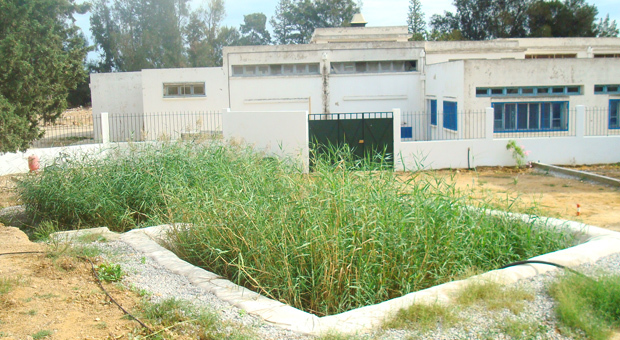 The Centre of Water Research and Technologies, CERTE is located at the Borj Cedria technopark, Tunisia. The main goal of CERTE is to carry activities on research development and innovative technologies in water fields and to integrate the obtained results at the economic and social levels.